I received a letter this week from Michelle Skinner at the Tri City Valley Cats. They are the single A short season for the Houston Astros and play in the New York-Penn league. Earlier in the season Michelle sent me a box full of goodies...card sets, bobble heads, t shirts, and many signed cards. That was an awesome day getting the mail and going through all the stuff. 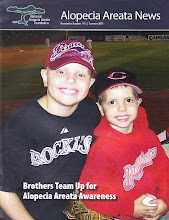 This week Michelle sent me a letter that they have been brainstorming ways to help alopecia. Finnigan's Sports Cards is a local card shop in Albany and they are sponsoring the baseball card machine at Joseph L Bruno Stadium, home of the Valley Cats. 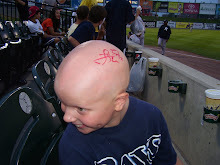 Finnigan's Sports Cards have partnered with the Valley Cats to support our cause by donating half of all the proceeds to the National Alopecia Areata Foundation through Autographs 4 Alopecia! We will be traveling to New York late in the season to be recognized and be presented with our donation! Thanks Michelle, Valley Cats staff, and Finnigan's Sports Cards for your much appreciated effort! So cool!! Blake and Gavin are doing an awesome job! It is great to see so many teams get behind the cause!